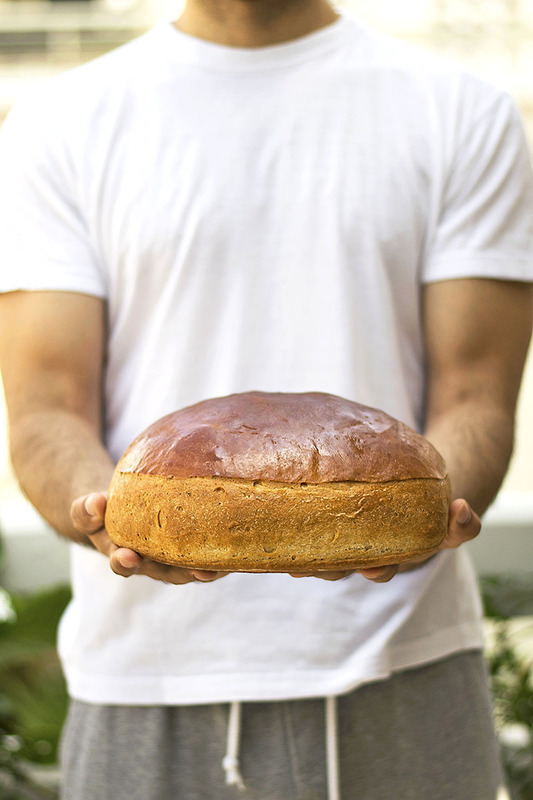 This Greek ceremonial bread, called Artos, is usually brought to church as an offering. It’s slightly sweet and very aromatic, great for breakfast or snack. This Greek ceremonial bread (Artos) is scented beautifully with some spices and has just a little sweetness to make things more interesting. And needless to say, it’s one of my favorite breads (I could eat it all day!). You can eat it for breakfast with a glass of milk, or as a snack with your afternoon coffee/tea and a generous slice of cheese. And those of you with a sweet tooth, note that it’s perfect when slathered with praline or chocolate spread, though some peanut butter and jelly (or tahini and honey) will also do! 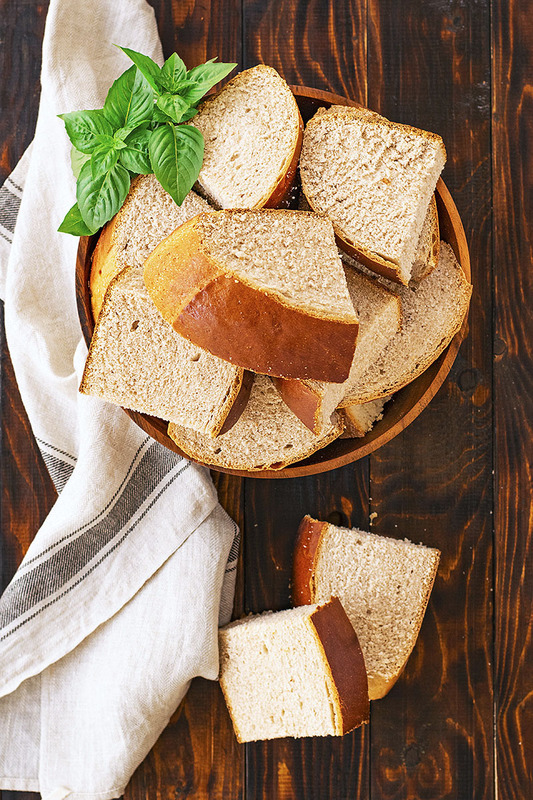 “Artos” means “bread” in ancient Greek, but nowadays the term has been replaced by the word “psomi”. 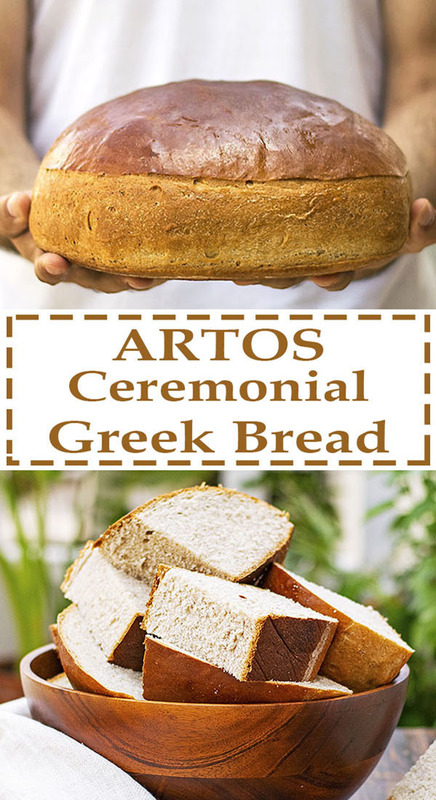 So, when someone says “Artos” he’s almost always referring to the special type of ceremonial bread which is brought to church in order to get divided and shared with all the people. It’s something like an offering. These offerings happen during certain holidays and occasions, and the people who want to participate always bring 5 Artos to the church. At the end of the ceremony and after all the Artoi (plural) have been blessed, the four of them will be cut into pieces and shared with the congregation while the fifth will be taken home by the one who brought it. There are many breads closely connected with Greek Orthodox tradition like this Greek Easter bread (tsoureki). There’s even a very moist and fluffy vegan oil cake, this Fanouropita which is made in the name of St. Fanourios! But Artos, maybe because of its size or maybe because of the whole ritual that surrounds it, is my favorite. And let’s not forget how good it tastes! Because of its’ religious character, Artos carries certain Orthodox symbols on its surface, transferred by a special wooden stamp. (However, no matter how hard I press the stamp, I almost always fail to make the marks to stay after baking). Also, before baking, it is scored horizontally, another symbolic action which represents the separation of the earth from the sky. 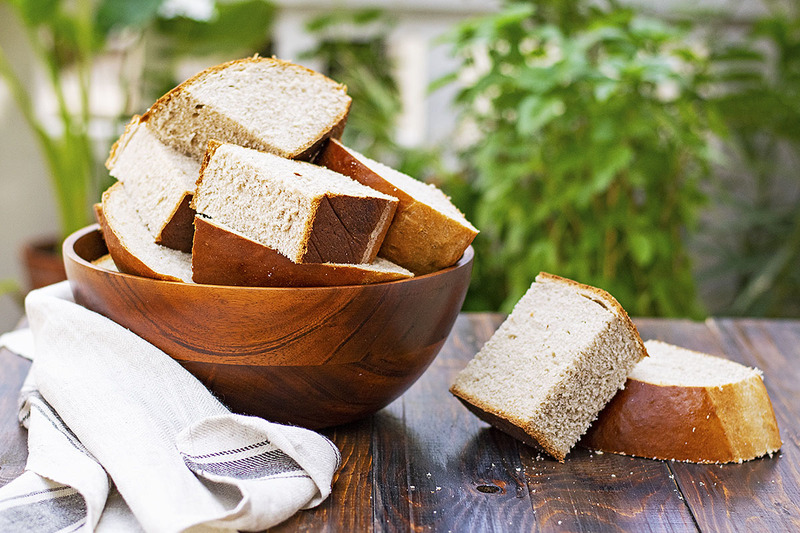 This scoring also helps the bread to expand vertically and keep its surface smooth without any cracks. Make sure the scented water is not hot, because it will kill the yeast. Dip your finger and it should feel just warm. In some places, especially outside Crete, aniseed may be used but I am not particularly fond of it, so I never use it. 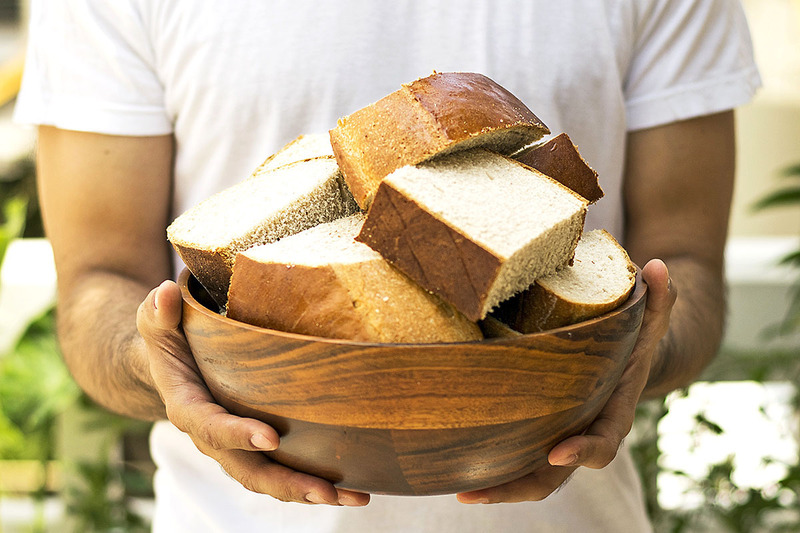 The time required by the bread to rise will depend on the temperature of your kitchen and the strength of the yeast. Usually, 2-4 hours are needed for the first rise of the dough. 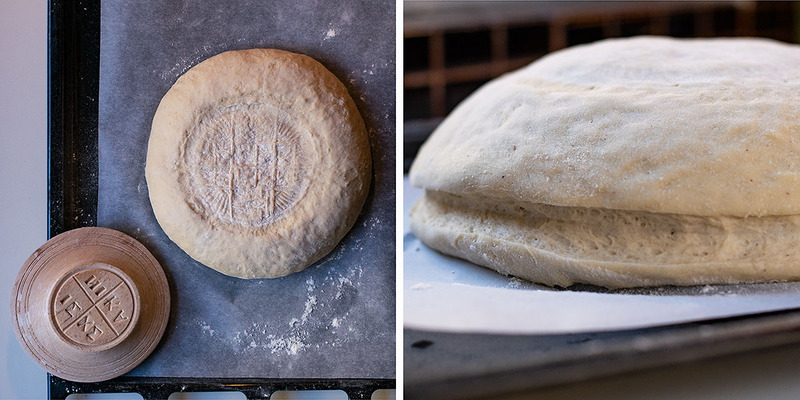 Brush the ceremonial Greek bread with a simple syrup just after you take it out of the oven. This will give it a glossy look. It will be sticky at first, but when dry it will be ok.
Keep the bread well-wrapped with cling film and inside a ziplock bag to keep it fresh. Make the scented water: Transfer the water, the bay leaves, the cinnamon, and the cloves to a small pot and bring to a boil. Turn off the heat and let it come to room temperature. Pass the water through a sieve. 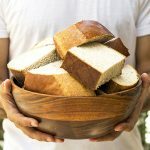 Make the Artos bread: In the bowl of your electric mixer mix 1 cup of the scented water, 1 tablespoon for the flour, the yeast and a pinch of sugar. Let it rest in a warm place for 5-10 minutes or until foamy. Then, add the rest of the flour, the sugar, the maple syrup or honey, the wine, the olive oil, the cinnamon and the salt. Knead with the dough attachment until a soft and pliable dough forms (about 10 minutes). If the dough is sticky, add the extra flour. Cover the bowl with a clean towel and let it rest in warm place until tripled in volume (about 2-3 hours). 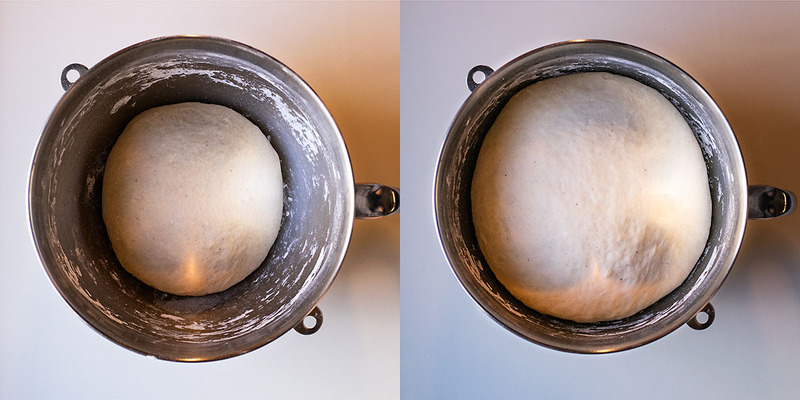 Punch the dough to deflate it, knead, and shape it into a ball. If you have the Artos stamp, dust it with flour and press it firmly on the center of the ball. Otherwise, flatten the ball with your hands to form a disk. Let it rest in a warm place until almost doubled in volume. In the meantime, preheat your oven to 350°F (175°C). Score the sides of the bread horizontally and bake for 50 minutes. If you notice that the surface browns quickly, cover with foil. Take the bread out of the oven and let it rest on a rack. Mix the boiling water with the sugar and lightly brush the surface to make it glossy. Let it cool completely. This recipe makes 10 large servings. To make one Artos the traditional size, you’ll need one and a half of this recipe. 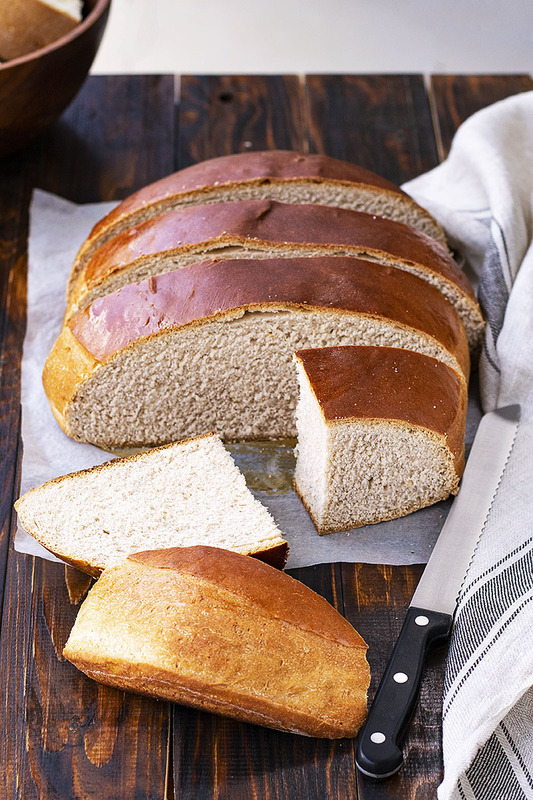 That crust…Yum, I wish I had a big slice of this bread with my coffee right now, it looks great! Thank you Akhila! It’s also great with some cheddar and a cup of tea!